What happened was the Browns became Baker Mayfield’s team. Even though the decision to switch quarterbacks late in the first half was forced upon Cleveland coach Hue Jackson with the concussion suffered by veteran starter Tyrod Taylor, it felt like a move that was coming at any minute, given the Browns’ building frustration on offense. 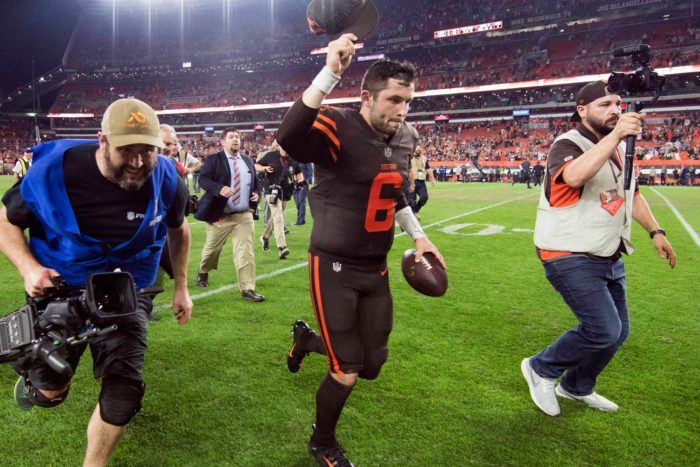 Mayfield’s inspired performance, leading Cleveland out of a 14-0 first-half hole to a four-point win that required a fourth-quarter rally, was the stuff of instant classic and will go down as one of the few high points in the history of the “new’’ Browns. And it also immediately gave rise to the obvious question: What took so long for Mayfield to find his way onto the field and did the Browns waste two-plus games with the charade of starting Taylor? Led by their swarming defense, the Jets were dominating Cleveland until they made the mistake of concussing Taylor, opening the door for the rookie Mayfield, the No. 1 overall pick in this year’s draft. With Taylor in the game, the Browns passing game had produced a paltry four completions for 19 yards on 14 attempts, with three sacks and a bevy of quarterback hits. Mayfield flipped a switch the second he entered, energized the entire stadium and his own sideline, and finished with an eye-opening 17 completions on 23 attempts, for 201 yards, with multiple drops lowering those totals. He took just one sack and finished with a sterling 100.1 passer rating, leading Cleveland to points on four of his first five drives, discounting an end of first half kneel-down. It was one of the most electrifying first-game rookie quarterback debuts in recent memory and secured Cleveland’s first win since Week 16 of 2016, a staggering stretch of 20 games. And it came against a Jets team that has started fellow rookie quarterback Sam Darnold from day one this season, after he had his own boffo debut in a big Week 1 win on “Monday Night Football” in Detroit. But Darnold struggled for the second week in a row in a Jets loss and was just a footnote in the all-engulfing Mayfield Mania by game’s end. As one-game referendums go, it’s fair to say the Browns choosing Mayfield over Darnold looks justified based on Thursday night’s outcome. Jackson did the somewhat predictable after the game and declined to instantly name Mayfield his starter for Week 4 at Oakland, saying he needed to first look at the film. But that was just a nod of respect toward the injured Taylor, who is one of the Browns’ captains, for what that’s now worth. Rest assured Mayfield is the man going forward in Cleveland, because Jackson would probably be instantly run out of town if he didn’t trust his eyes and make the change official after what he saw Thursday night. * Josh Allen, Buffalo, Week 1: The seventh overall pick, Allen entered in the third quarter of the Bills’ disastrous 47-3 opening-day loss at Baltimore, replacing the overmatched Nathan Peterman. Buffalo trailed 40-0 with 11-plus minutes remaining in the quarter. He finished 6 of 15 for 74 yards with no touchdowns or interceptions, taking three sacks and rushing four times for 26 yards. 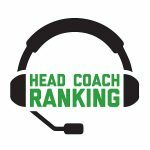 * Mitchell Trubisky, Chicago, Week 5: Trubisky was inserted into the Bears lineup after veteran free-agent signee Mike Glennon melted down with a four-turnover performance in a blowout loss at Green Bay in Week 4. Chicago lost 20-17 at Minnesota in Trubisky’s debut, with the No. 2 overall pick finishing a decent but modest 12 of 25 for 128 yards, with one touchdown, one interception, one sack and three rushes for 22 yards. * DeShaun Watson, Houston, Week 1: It only took until halftime of an opening-day 29-7 home loss to Jacksonville for Texans head coach Bill O’Brien to see the error of his ways. He benched veteran Tom Savage, who endured six sacks in his two quarters, and went to Watson, the 12th overall draft pick. Watson wasn’t great, but he gave Houston a bit of a spark that day, completing 12 of 23 passes for 102 yards, with one touchdown, one interception, four sacks and two runs for 16 yards. He went on to produce a sensational 21 combined passing and rushing touchdowns in just six-and-a-half games for Houston, before a knee injury ended his rookie season prematurely in early November. * Jared Goff, Los Angeles Rams, Week 11: Rams head coach Jeff Fisher consistently resisted calls to bench Case Keenum and start Goff as a rookie, finally relenting and giving the first overall pick his opportunity at home against Miami in mid-November. Los Angeles led the game 10-0 entering the fourth quarter but gave up two touchdowns to the Dolphins and lost 14-10. Goff was unspectacular in his debut, completing 17 of 31 passes for 134 yards, with no touchdowns or interceptions, and just one sack. * Paxton Lynch, Denver, Week 4: The Broncos took Lynch 26th overall and then didn’t play him until starter Trevor Siemian injured his shoulder on a sack shortly before halftime in a 27-7 victory at Tampa Bay. Lynch was pretty sharp in his relief role, completing 14 of 24 passes for 170 yards with a touchdown, no interceptions and a crisp 94.1 passer rating. He took just one sack, and wound up starting the following week for Siemian, losing at home to Atlanta. His only other start as a rookie came in Week 13, with a so-so performance in a 20-10 win at Jacksonville. * Johnny Manziel, Cleveland, Week 13: The Browns benched the slumping Brian Hoyer early in the fourth quarter of a 26-10 loss at Buffalo, putting in the celebrated rookie and former Heisman winner they drafted 22nd overall. Manziel led the Browns on an eight-play, 80-yard touchdown march on his first drive, then flashed his trademark money signs after scoring on a 10-yard run. Hoyer reclaimed his starting job the following week, but the Browns gave Manziel two more starts in Weeks 15 and 16, and he was dismal in losing to Cincinnati and at Carolina. * Teddy Bridgewater, Minnesota, Week 4: The Vikings intended to start Matt Cassel in 2014, but an injury to the veteran changed their plans and elevated Bridgewater earlier than expected. The 32nd and final pick of the first round, Bridgewater was outstanding as a starter in a 41-28 home win against Atlanta, completing 19 of 30 passes for 317 yards, without a touchdown or interception. He ran for a 13-yard score, but left the game in the fourth quarter with an ankle injury, rushing five times for 27 yards overall. * Blake Bortles, Jacksonville, Week 3: The Jaguars gave veteran Chad Henne two-and-a-half games before they benched him in favor of Bortles, the No. 3 overall pick. Jacksonville was trailing 30-0 to the visiting Colts when Bortles got the nod, and he actually put on a pretty good debut in the 44-17 loss. Bortles completed 14 of 24 passes for 223 yards with two touchdowns and two interceptions in what amounted to 30 minutes of garbage time, with one sack and two rushes for 30 yards. He held the starting job the rest of the season.